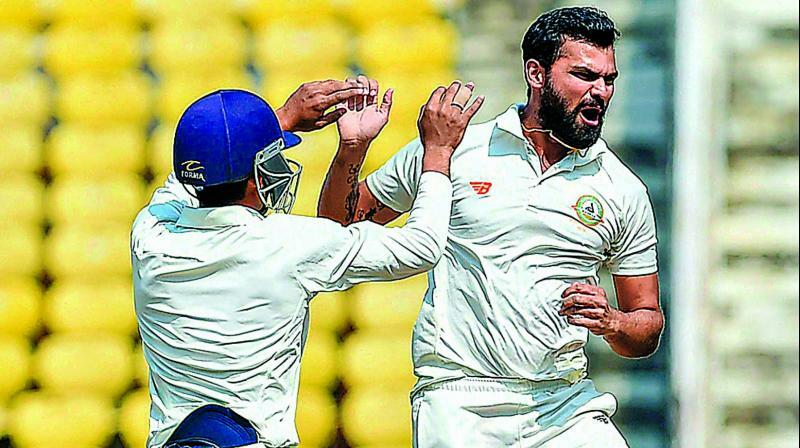 Left-arm spinner Aditya Sarvate saved the day for Vidarbha cricket team on the day 4 of the Ranji Trophy final between Vidarbha and Saurashtra at VCA Stadium in Nagpur. Sarvate performed both with the bat and the ball on Day 4 to pull Vidarbha out of trouble and bring it back in the game. He not only scored a crucial 49 runs for Vidarbha in the 2nd innings bringing the team total to 200 runs, but also picked up three early and important wickets to bring Vidarbha back into the game against Saurashtra. The wickets, which Sarvate clinched were that of Harvik Desai, Snell Patel and Cheteshwar Pujara. Umesh Yadav and Akshay Wakhare also picked up one wicket each. At the end of Day 4, Saurashtra total stood at 58 for five wickets with Vishvaraj Jadeja and Kamlesh Makvana on the crease. Being dismissed for 312 in the 1st innings of the match, defending champions Vidarbha bowled Saurashtra out for 307 runs. While Sarvate clinched five wickets for Vidarbha in the first innings, right-arm spinner Akshay Wakhare clinched four wickets. Even as all looked well for Vidarbha in the 2nd innings, the top batting order crumbled bringing the team total to 200 runs. Saurashtra needs another 148 runs with five wickets in hand to win against defending champions Vidarbha on Day 5 of the Ranji Trophy final match on February 7.